It is possible to infer some facts by capturing them directly or trying to trace their evolutions and changes mentally. This will guarantee human beings a sort of self-confidence, control and power. Some sustained patterns of natural, biological and human artifacts provide trusty physical and objective proofs on their success and survive. The research claims that the secret beyond the success of these patterns lies in ambiguous or hidden or invisible orders within the seeming randomness and complexity. Successful systems reflect distinguishable order when they reach a critical threshold of stability and self-organizing between their trends to connect and to compact. Then, patterns can reveal themselves and express their similar structural and morphological changes. In the same manner, guiding other systems to reach such edges and thresholds may ensure having successful patterns, solving serious problems and leading the way ahead correctly. The research depends on a new mathematical tool from the Fractal Geometry to reveal and measure the hidden orders in these patterns by calculating the repetitions of form's changes. This tool could be defined as a Fractal Dimension (D), which is considered to be a sensitive index or parameter of the system's behaviors. Also, the research adopts the comparative analysis method of analyze and measure the form of a trusty successful, natural and sustained pattern of a fruit trees orchard, trying to find a numerical order by calculating its fractal dimension. The obtained fractal dimension represents a referential base in analyzing some patterns of urban systems (e.g. Baghdad's two dimensional image), a reliable index and parameter to detect the system's behaviors and trends to connect or to compact. Comparing the pattern of an existing urban fabric for the city of Baghdad with the orchard's pattern refers to an obvious defect in the inner structure and morphology of the capital. Baghdad tends to connect rather than to compact in a pathological way. The research ends with the need for urgent and careful interference to tune the parameters of connectivity and compactivity equally by suitable and practical suggestions and recommendations. من الممكن الاستدلال على بعض الحقائق ذهنياً رغم تغيّرها المستمر. فتعقّب هذا التغيّر وإدراكه يضمن للإنسان نوعاً من الاطمئنان من مخاوفه، والثقة بنفسه، والتفوّق على ماحوله. وتقدم أشكال بعض الأنساق المستدامة (Sustained Patterns) الدليل الموضوعي الموثوق على نجاح وتفوّق العديد من النتاجات الاحيائية والطبيعية والبشرية... التي صمدت وثبُتت حتى وصلت إلينا. ويعزو البحث سر نجاح مثل هذه الأنساق الى أنماطٍ كامنةٍ فيها قد لا تكون واضحة للعيان أو مخفية ضمن ما يبدو من عشوائية وتعقيد (وهذا ما تطرحه نظرية الفوضى (Chaos Theory)، وإحدى تطبيقاتها العمليّة المتمثلة بالهندسة الكسرية أو الجزئية (Fractal Geometry) اللاإقليدية). ولكن يمكن الاستدلال عليها عن طريق حساب ما يُعرَف بالبعد الكسري أو الجزئي (Fractal Dimension/ D) اللاإقليدي باعتباره مؤشراً حساساً لنمط التغيّر. عمد البحث الى تحليل وتقييس النسق الشكلي لنموذج احيائي ناجح ومتزن ومستدام بشكل موثوق (بستان زيتون) لإيجاد نمط رقمي ضمنه عن طريق إحتساب بعده الكسري أو الجزئي اللاإقليدي. حيث يرى البحث ان للأنظمة الناجحة ميول متشابهة للارتباط والاتصال (Connection) من جهة، والتراص (Compactness) من جهة أخرى، لتكشف هذه الأنظمة عن نفسها على هيئة أنساق عند وصولها الى حد أو حافة أو حالة من الاتزان والتنظيم الذاتي (Self-Organized Criticality). ثم تبنى البحث أسلوب التحليل المقارن (Comparative Analysis) عند دراسته لنسق نظام حضري ببعدين (2-Dim.) واقع وقائم (المخطط الأفقي لمدينة بغداد) اعتماداً على نسق بستان الزيتون. The volumetric mass transfer coefficient kL.a was calculated using two gases (air and CO2) in water and NaOH solution. The experiments were carried out using 0.1 m column diameter. Empirical and Artificial Neural Network (ANN) correlation were developed to predicted mass transfer coefficient in form of dimensionless groups (Sh, Re,Bo and We). The use of Back Propagation Neural Network (BPNN) gave better results than other correlations found in literature and than the empirical one found in this study. تمت دراسة معامل الانتقال الحجمي في عمود فقاعي ذو قطر 0.1 متر يحتوي على موزع للغاز ذو 79 فتحة بقطر 2 مليمتر لكل فتحة باستخدام الهواء و ثاني اوكسيد الكاربون للطور الغازي و الماء ومحلول هيدروكسيد الصوديوم للطور السائل. تم تطوير معادلة عامة وإستخدام الشبكة الذكية المصطنعة ( ANN) لحساب معامل انتقال الكتلة الحجمي من خلال استخدام مجاميع عديمة الوحدات ( We,Sh,Re,Bo ). إستخدام الشبكة الذكية من نوع التوالد العكسي ( BPNN ) اعطى نتائج متميزة احسن من تلك الموجودة في الادبيات. Bubble column --- Mass transfer coefficient --- Artificial neural network. Recovery of copper from actual spent etchant cupric chloride solution used in manufacturing of printed circuit board (PCB) containing 124 g/l Cu^+2 ions concentration and 60 g/l hydrochloric acid was investigated in a batch mode jacketed tank. This tank was constructed with inner dimensions of 19×10×15 cm^3. Cylindrical rode-shape titanium was used as cathode, while two rectangular shaped graphite were used as anodes. The parameters studied were: current density (0.16-0.30 A/cm^2), copper concentration in etchant solution (30-124 g/l) and the temperature (25-45 °C). The highest current efficiency obtained was about 92% and the lowest power consumption achieved was about 2.7 W.h/g within the temperature range 25-35 °C.يهدف البحث الى استعادة النحاس بطريقة الترسيب الالكتروليتي من محلول كلوريد النحاس الفائض (المتخلف) من انتاج البطاقات الالكترونية، يحتوي المحلول على ايونات النحاس بتركيز 124 غملتر و حامض الهيدروكلوريك بتركيز 60 غماتر. تم البحث باستخدام نظام الوجبات في خزان ذو جاكيت لغرض التبريد و بابعاد داخلية 19×10×15 سم^3. استخدم قطب كاثود اسطواني الشكل من التيتانيوم و قطبي الانود مستطيلي الشكل من مادة الكرافيت. درست الظروف التشغيلية التالية: كثافة تيار (0.16-0.30 امبيرسم^2) و تركيز ايونات النحاس بالمحلول (31-124 غملتر) و درجة الحرارة (25-45 5^م). اعلى كفاءة تيار تم الحصول عليها كانت حوالي 92 % و اقل طاقة مستهلكة لترسيب النحاس على سطح الكاثود بالساعة كانت حوالي 2.7 واطزساعةغم ضمن درجة الحرارة 25-35 5^م. Electro winning --- copper recovery --- spent etchant --- cupric chloride. There is a problem, in Iraq, due to the multitude of malfunction after the overall annual maintenance has been achieved, and that raises the cost of continuous repairs, one of the reasons of this problem, is the absence of planned testing and automation for testing devices, the second reason is the neglect of concentrating on a database, the third one is not following an integrated testing system for all parts, as well as, there are no documented reports for inspected parts. Most of various nondestructive inspection techniques have been achieved random selection steps. The lack of a documentation system leads to lack of historical information a bout failures parts of a boiler that affect inspection decision process. 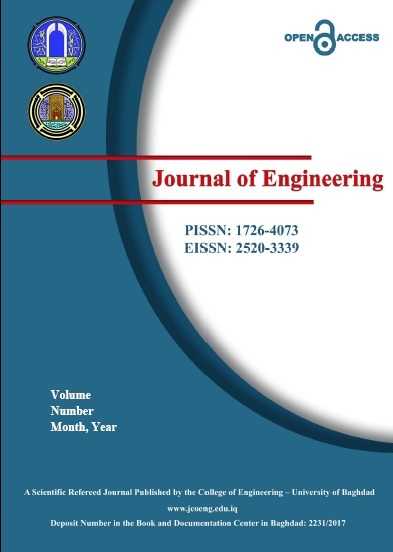 This paper summarizes Programmed system designing and computerized for internal inspection of boiler heatsurfaces (IIBHS) at Nassyriah power station as an example. في العراق هناك مشكلة في كثرة الأعطال بعد القيام بالصيانة السنوية الشاملة وزيادة كلفة التصليح باستمرار وكان أحد أسباب هذه المشكلة غياب الفحص المبرمج والأتمتة في أجهزة الفحص مع عدم التركيز على قاعدة معلومات وعدم إتباع نظام فحص متكامل لكل أجزاء المنظومة وغيرها من الأسباب الكثيرة جداً والتي لا مجال لذكرها أو ذكر أهميتها.في هذا البحث تم التركيز على وضع نظام فحص داخلي واختبار للسطوح الحرارية في مرجل محطة كهرباء الناصرية. Internal Inspection of Boiler --- Inspection and test for boiler in thermal power station --- Inspection of Heat surfaces in thermal power. This paper introduce a new method for using a systolic array to perform the one, and two dimension discrete wavelet transform (1-D DWT, and 2-D DWT). The 1-D needs only a semi-systolic array for its realization. However, it was found that the 2-D method needs the combination of two types of semi-systolic array into one systolic array to achieve its implementation. في هذا البحث تم تقديم طريقة جديدة لايجاد تحويل ال"wavelet" المتقطع احادي البعد (1-D DWT) وثنائي البعد (2-D DWT) باستخدام مصفوفة ال" systolic ". في تحويل ال"wavelet" المتقطع احادي البعد (1-D DWT) استخدمنا شبه مصفوفة ال"systolic". بينما في تحويل ال"wavelet" المتقطع ثنائي البعد (2-D DWT) تم دمج مصفوفتان من شبه ال"systolic" لانتاج مصفوفة "systolic" كاملة. 1-D DWT --- 2-D DWT --- Semi-systolic array --- and Systolic array. This research pertains to expand the formulation and applicability of using confinement and expansion due to Poisson’s ratio models for three dimensional non-linear finite element analysis of reinforced concrete members. A plasticity based model that acknowledges the asymmetric response of reinforced concrete under multiaxial stress conditions is used to account for the strength improvement under conditions of triaxial compression. Complex behavior of concrete such as compression softening and tension softening are incorporated to simulate concrete behavior. DIANA software is used for finite element analysis with the inclusion of confinement and expansion effects. The concept of material pre-strains is extended to accommodate modeling of the Poison’s ratio effect. The applicability of the suggested confinement and expansion models are verified by comparing the results of Kupfer and Vecchio – Collins tests on shear panels with that obtained from DIANA software. These comparisons illustrate the ability of the confinement and expansion models to obtain the response of reinforced concrete members subjected to multiaxial stress conditions.في هذا البحث تم صياغة و تطبيق نموذج للحصروالتوسع بسبب نسبة بواسون في التحليل اللا خطي الثلاثي الابعاد باستخدام طريقة العناصر المحددة. جرى استخدام النموذج اللدن تحت تاثير حالة اجهاد متعدد المحاورلبيان مدى تاثير التحسن في مقاومة الخرسانة لاجهادات الانضغاط . كذلك جرى الاخذ بنظر الاعتبار تاثير تطرية الانضغاط وتطرية الانفعال للشد وتاثير الخرسانة ذات المقاومة العالية. تم استعمال برنامج DIANA للتحليل مع اخذ تاثير الحصر والتوسع بنظر الاعتبار. ان فكرة الانفعال المسبق تم استخدامها لبيان تاثير التوسع الناتج من نسبة بواسون. لبيان مدى تطبيقية استخدام نموذجي الحصر والتوسع المقترحين فقد جرى مقارنة نتائج فحوصات كوبفروفيشكو – كولنز لبلاطات خرسانية مع تلك المستحصلة من التحليل باستخدام برنامج DIANA . المقارنة بينت قابلية نموذجي الحصروالتوسع المقترحين على عكس تصرف الاعضاء الخرسانية المسلحة المعرضة الى حالات اجهاد متعدد المحاور بصورة جيدة. Compressive behavior --- Confined concrete model --- DIANA software --- Expansion model --- Finite element. The present work is an attempt to investigate the vibrations characteristics and effect of static stresses and deformation in partially pressurized thick cylindrical shells, such as the gun barrels. The method used cover analytical investigation developed to determine static stresses and deformation along the thick cylindrical shell using LAME'S equation. The numerical investigation is developed using the finite element method with axisymmetric element (Plane 42) four nodes to determine the static response and solid element (Solid 45) eight nodes for vibration analysis by using the ANSYS package. The obtained results show a good agreement with the other investigators. It's found that the natural frequency of the selected models almost equal (150. Hz) and these results indicate that the frequency of powder gasses pressure more than (150 Hz) to be far away from resonance phenomena.أن العمل الحالي هو محاولة لمعرفة الخصائص الاهتزازية و تأثير الاجهادات و التشوهات الاستاتيكية في الاسطوانات سميكة الجدران كما هو الحال في سبطانة المدفع. وتشمل الطرق المستخدمة, التقنيات التحليلية و العددية, طور الحل التحليلي لإيجاد الاجهادات و التشوهات الاستاتيكية على طول النماذج المستخدمة باستعمال معادلة لامي LAME'S EQUATION)), تم انجاز الحل العددي باستخدام طريقة العناصر المحددة و اختيار العنصر المسطح (Plane 42) ذو الأربع عقدة لإيجاد الاستجابة الاستاتيكية, و العنصر الصلب (Solid 45) ذو ثمانية عقد لحساب الاهتزازات الحرة و باستخدام برنامج حاسبة ANSYS)). بينت النتائج التي تم الحصول عليها تطابقا جيدا مع نتائج الباحثين الآخرين. لقد وجد بأن التردد الطبيعي للنماذج المستخدمة (150 Hz) تقريبا وتبين هذه النتيجة بان تردد ضغط الغازات يجب أن يكون اكبر من (150 Hz) لتكون بعيدة عن ظاهرة الرنين. Thick Cylinder --- Barrels --- FEM --- Static Stresses --- ANSYS Package --- Vibration. Experiments were carried out to study the local and average heat transfer by natural convection in a vertical concentric cylindrical annulus. The experimental setup consists of an annulus has a radius ratio of 0.555 and inner cylinder with a heated length 1.2m subjected to the constant heat flux while the outer cylinder is subjected to the ambient temperature. The investigation covers heat flux range from 58.2 W/m^2 to 274.31 W/m^2. Results show an increase in the natural convection as heat flux increases leads to an improve in the heat transfer process. An empirical equation of average Nusselt number as a function of Raylieh number was deduced . أجريت تجارب عملية لدراسة انتقال الحرارة الموقعي و المعدل بالحمل الحر بتجويف حلقي بين أسطوانتين متحدتي المركز بالوضع العمودي، نسبة نصف القطر لهما تعادل 0.555 و بطول 1.2 متر . سخنت الأسطوانة الداخلية تحت فيض حراري ثابت، بينما عرّضت الأسطوانة الخارجية إلى درجة حرارة الجو. تغطي الدراسة مدى للفيض الحراري يتراوح من 58.2 W/m^2 إلى 274.31 W/m^2 . بيّنت النتائج زيادة معدلات الحمل الحر بزيادة الفيض الحراري مما يؤدي إلى تحسين معامل انتقال الحرارة. Heat Transfer --- Natural Convection --- Concentric Annulus. Numerical solutions are presented for the transient natural convection heat transfer problem in horizontal isothermal cylindrical annuli, enclosed in heated inner and cooled outer cylinders. Solutions for laminar case were obtained within Grashof number based on the inner diameter which varied from 1x10^2 to 1x10^5 in air. Both vorticity and energy equations were solved using alternating direction implicit (ADI) method and stream function equation by successive over relaxation (SOR) method. The structure of fluid flow such as a velocity vector and temperature distribution as well as Nusselt number were obtained and the effect of diameter ratio on them is examined. In addition, the Grashof number was changed with the influence of variation Prandtle number and diameter ratio. Our numerical calculation are summarized by Nussult number vs. Grashof number curves with diameter ratios and prandtl as a parameter, which serves as a guide to natural convection heat transfer calculated from annulus. Good agreement with previous data were obtained. يقَدَّم هذا البحث حَلّ عددي لمسالةِ انتقال الحرارةِ العابرةِ بالحمل ِ الطبيعيِ في العمود الحلقي الإسطوانيِ ثابت درجة الحرارةِ بوضع الأفقيِ، حيث تكونَ الاسطوانة الداخليةِ مسخنِة وَ الإسطوانة َ الخارجيةَ مبردة .تم حل المسالة لحالةِ الجريان الطباقي ولرقم كراشوف مستندة على القطرِ الداخليِ يتراوح بين 1x10^2 الى 1x10^5 للهواء. ِمعادلة الدوامية ومعادلة الطاقةِ حلتا بإستعمال بطريقة الإتّجاهَ الضمنيَ المتناوبُ ومعادلة الانسياب بطريقة فوق التراخي المتعاقبة.تم الحصول علىّ تركيبَ جريان المائعِ كمتجه السرعةِ وتوزيعِ درجةِ حرارة بالإضافة إلى رقم نسلت، تم اختبار تأثيرِ نسبةِ القطرِ عليها. بالإضافة الى دراسة تأثيرِ إختلافِ رقم كراشوف مع إختلافِ رقم برانتل و نسبة القطرَ عليهاَ. تم اجمال الحسابات العددية بواسطة منحنيات رقم نسلت مع رقم كراشوف و نسبة القطرَ ورقم برانتل. التي يمكن الاستفادة منها كدليل لحسابات انتقال الحرارة بالحمل الطبيعي من الشكل الحلقي.تم الحصول على توافق جيد بين النتائج الحالية وبياناتِ البحوث السابقةِ. Natural Convection --- Numerical Simulation --- Isothermal --- Cylindrical Annuli. A theoretical study of heat transfer and fluid flow phenomena in welding process has been carried out in the present work. The study involved the numerical solution of the transient Navier-Stokes and Energy equations of the weld pool region by using Finite Difference Method. The electromagnetic force field and buoyancy were included in the formulation The stream-vorticity formulation was used in the mathematical model. The numerical solution is capable of calculating the vorticity, stream function, velocity, temperature, and the interface movement of the weld pool in Gas Metal Arc Welding (GMAW). The model can be used to solve the Gas Tungesten Arc Welding (GTAW) problem. A numerical calculations algorithm was developed to carry out the numerical solution. The numerical results showed that the finger penetration phenomena occurs in the Gas Metal Arc weld is adequately explained through the application of the model. It is found that the frequency of spray transfer is a dominant factor in addition to shape of the weld pool geometry. A verification of numerical results was made through a comparison with a previous work, the agreement was good, confirming the capability and reliability of the proposed numerical algorithm in calculating fluid flow and heat transfer in Gas Metal Arc weld pools. في هذا البحث ، تمت دراسة انتقال الحرارة وجريان المائع في عمليات اللحام ألانصهاري نظرياً ، تضمنت الدراسة النظرية الحل العددي للمنظومة العابرة (غير المستقرة ) لمعادلة الزخم والطاقة لمنطقة بركة اللحام (منطقة الطور المنصهر ) باستخدام طريقة الفروق المحددة. تضمنت الصياغة قوة المجال الكهرومغناطيسي وقوة الطفو وتم استخدام صياغة الدوامية ودالة الانسياب في النمذجة الرياضية . أمكانية الحل العددي تتضمن حساب الدوامية ، دالة الانسياب ، السرعة ، درجة الحرارة والسطح البيني المتحرك لمنطقة اللحام بطريقة لحام القوس الكهربائي المعدني باستعمال غطاء غازي . هذا النموذج نستطيع استخدامه لحل المسألة بطريقة لحام القوس الكهربائي بقطب التنكستن باستعمال الغاز الواقي . تم التوصل لبرنامج حسابات عددية لتنفيذ الحل العددي . أظهرت النتائج العددية بأن ظاهرة التغلغل الإصبعي التي تحدث في طريقة لحام القوس الكهربائي المعدني باستعمال غطاء غازي وافية بالغرض للتوضيح من خلال التطبيق في النموذج المعمول به . لقد وجدنا بـأن مقدار أنتقال الرش الترددي هو العامل السائد بجانب الشكل الهندسي المستخرج لبركة اللحام . تمت مقارنة النتائج العددية التي تم إنجازها مع البحوث السابقة . التوافق بين النتائج جيد ويؤكد أمكانية وموثوقية الخطوات العددية المقترحة في حساب جريان المائع وانتقال الحرارة بطريقة لحام القوس الكهربائي المعدني باستعمال غطاء غازي في بركة اللحام . This paper describes a comparison between beam-column junctions with and without construction joint, also, a parametric study deals with construction joint is presented by taking various conditions of the junction. These include the various positions of the construction joint, the axial load on the column, strength of concrete in the second cast and the amount of dowels crossing the joint. By developing a computer program which was originally written by Dr. Ihsan Al-Shaarbaf (1990), (P3DNFEA, program of three dimensional nonlinear finite element analysis), to consider the effect of construction joint depending on the fact that the shear force can be transmitted across the shear plane either by interlocking of the aggregate particles protruding from each face or by dowel action of the reinforcement crossing the cracks by using Fronteddu’s and Millard’s models, respectively. It is concluded that the construction joints existed in the beam-column junctions result in a significant reduction in the in-plane shear stiffness and it would affect only on the rotation and shear strains of the joint.هذا البحث تضمن مقارنة بين مفاصل الجسور والاعمدة الخرسانية بوجود المفاصل الانشائية وبعدم وجودها كذلك اجريت دراسة واسعة تضمنت كل مايتعلق بالعوامل المؤثرة بالمفصل الانشائي. هذه العوامل تتضمن المواقع المختلفة للمفصل الانشائي، الحمل المحوري للعمود، المقاومة الانضغاطية للخرسانة ضمن الصبة الثانية ومقدار الحديد المار من خلال المفصل. من خلال تطوير برنامج الحاسوب المكتوب اصلا من قبل الدكتور احسان الشعرباف (P3DNFEA وهو برنامج لتحليل المسائل ثلاثية الابعاد تحليلا لاخطيا بطريقة العناصر المحددة)، لادخال تاثير المفصل الانشائي اعتمادا على حقيقة انتقال قوة القص خلال السطح القصي اما عن طريق تداخل حبيبات الركام البارزة من كل وجه او عن طريق تاثير التوتيد للحديد المار من خلال ذلك السطح وذلك باستخدام مويلات فرونتيدو وميلارد بالتتابع. وبعد تطوير البرنامج واجراء التحليل تم الاستنتاج بان المفصل الانشائي الموجود ضمن مفاصل الجسور والاعمدة الخرسانية يؤدي الى تناقص ملحوض في الصلابة القصية وهو يؤثر فقط على دوران المفصل وعلى الانفعالات القصية فيه. In adjustment of geodetic and photogrammetric networks, the surveying engineer faces many problems, such as errors of blunder nature in the observations (when comparing the homogeny of precision) make these observations odd from the result, and effecting directly on observation values after adjustment, and the statistical results after analysis as, adjusted coordinates of points, standard deviations, and ellipse of errors. The research is deal with some of the most common usage of statistical methods to detect these odds observations to confirm which best method is, by studying the advantages and disadvantages of each method to geodetic network. Three statistical methods will use in the analysis, these are:- 1. Standardized residuals method 2. F-t test 3. Robust estimation method The adjustments were accomplished by preparing a Matlab program with the three blunder detection methods and the results were evaluated and some scientific conclusions were reached. It was found that the robust estimation method represent the better blunder detection technique due to its ability in what is called (multi-blunder detection) , and the resulted higher accuracy indices. عند تصحيح الشبكات الجيوديسية وشبكات التثليث الجوي تعترض مهندس المساحة جملة من الأمور منها وجود أخطاء ذات طابع غلطي في بعض الارصادات (عند مقارنة تجانس الدقة) تجعل من هذه الارصادات شاذة عن البقية ,وتؤثر بصورة مباشرة على قيم الارصادات بعد التصحيح والنتائج الاحصائية بعد التحليل كالإحداثيات المصححه للنقاط والانحرافات المعيارية اضافة الى الشكل الاهليليجي للأخطاء الناتجة. يتناول البحث مجموعة من الطرق الإحصائية الشائعة والمستخدمة للكشف عن هذه الرصدات الشاذة لاقرار الطريقة الافضل من خلال دراسة محاسن و مساوئ كل طريقة لشبكة جيوديسية .حيث اختيرت ثلاثة طرق احصائية متمثلة بالاتي: 1. طريقة البواقي القياسية (Standardized residuals method) 2. طريقة اختبار (F-t) test 3. طريقة التخمين المتين (Robust estimation method) وباعداد برنامج بلغة (Matlab) تم اجراء التصحيح وتخمين النتائج للحصول على بعض الاستنتاجات العلمية والكشف عن الرصدات الشاذة بتطبيق الطرق الثلاث أعلاه. وقد وجد ان طريقة التخمين المتين (Robust estimation method ) تمثل أفضل تقنيه في الكشف عن الرصدات الشاذة استنادا إلى قابلية الطريقة في الكشف المتعدد للرصدات الشاذة (multi –blunder detection) وبسبب الدقة العالية التي توفرها هذه الطريقة مقارنة مع الطريقتين الأخريين. A theoretical study for a three-dimensional natural convection heat transfer from an isothermal horizontal , vertical and inclined heated square flat plates (with and without circular hole) has been done in the present work. The study involved the numerical solution of the transient Navier-Stokes and energy equations by using finite deference method (F.D.M.). The complete Navier-Stokes equation are transformed and expressed in terms of vorticity-vector potential. The Energy and Vorticity equations were solved by using an Alternating Direction Implicit (ADI) method because they are transient equations of parabolic portion, and the Vector potential is solved by using an equations Successive Over-Relaxation (S.O.R) method because it is from elliptic portion. The numerical solution is capable of calculating the Vector potential, three components of Vorticity and temperature field of the calculation domain. The numerical results were obtained in rang of Grashof number (10^3≤Gr≤5x10^4) with Prandtl number of (0.72) for square flat plate and the other consist a circle hole with ratio 0.6 and 0.8 diameter of the hole to main square side length. The numerical results showed that the main process of heat transfer is conduction for Grashof number less than 10^3 and convection for Grashof number larger than 10^3 and the results of local Nusselt number show fairly large dependence on inclination angle. For horizontal plate facing upward and downward, average Nusselt number is proportional to one-fifth power of Rayleigh number, and there is a significant difference in heat transfer rates between the upward and downward cases. For horizontal plate with circle hole facing upward for Grashof number 10^4, the effect of core portion caused a limited increment in the heat transfer rate, where as for the facing downward case, the effect was larger and the maximum value of heat transfer rates is be for square flat plate with circle hole by ratio 0.6 for all inclination angles. With the increase of Grashof number to 5x104 heat transfer rates decrease except the square horizontal flat plate with circle hole by ratio 0.6 . The average Nusselt number increases with the increase of inclination of plates facing upward to reach to the higher average Nusselt number at vertical position then decrease with increase of inclination of plates. And the maximum value of average Nusselt number is depended on the ratio of diameter of the hole to main square side length, showed that the maximum temperature gradient occurs at the external edge of the horizontal plate (with and without circle hole) facing upward and at the lower external edge in inclined case. The numerical results was made through comparison with a previous numerical and experimental work, the agreement was good. يقدم هذا البحث دراسة نظرية لانتقال الحرارة ثلاثي الأبعاد للحمل الحر من صفيحة مربعة و أخرى ذات ثقب دائري أفقية و عمودية و مائلة عن الأفق مسخنة بثبوت درجة الحرارة. تضمنت الدراسة ، الحل العددي لمعادلات الزخم الكاملة والطاقة الانتقالية باستخدام طريقة الفروق المحددة . معادلات الزخم الكاملة تم تحويلها والتعبير عنها بدلالة الدوامية و متجه الجهد الكامن. تم حـل كل من معادلة الطاقة و معادلة دالة نقل الدواميـة باستخدام طريقة(الاتجاه المتناوب الضمني)، وذلك لكونها معادلات انتقالية من نوع القطع المكافئ، و حل معادلة متجه الجهد الكامن بطريقة فوق التراخي المتعاقبة لكونها معادلات من نوع قطع ناقص. يتضمن الحل العددي حساب كل من متجه الجهد الكامن والمركبات الثلاث للدوامية ودرجة الحرارة لمنطقة الحساب. النتائج التي حصل عليها لحدود رقم كراشوف(Gr ≤ 5x10^4 ≥) مع رقم براندتل(0.72) للصفيحة المربعة و الصفيحة المثقبة بنسبة قطر الثقب الدائري إلى طول ضلع الصفيحة المربعة مساوٍ إلى 0.6و 0.8 . بينت النتائج العددية إن العملية الرئيسية لانتقال الحرارة هي التوصيل لرقم كراشوف 10^3 والحمل لرقم كراشوف أعلى من 10^3 و إن رقم نسلت الموضعي يعتمد كليا على زاوية الميلان. في حالة الصفيحة الأفقية وجهها المسخن إلى الأعلى والأسفل، متوسط رقم نسلت يتناسب مع رقم رالي للأس (5/1)، كذلك هنالك اختلاف واضح في معدلات انتقال الحرارة بين الوضع الأفقي الموجه للأعلى والأسفل. يسبب تأثير قطر الثقب لرقم كراشوف 10^4 زيادة محدودة في معدلات انتقال الحرارة في حالة الصفيحة المثقبة وجهها المسخن إلى الأعلى بينما تكون اكثر تأثيرا في حالة الصفيحة المثقبة وجهها المسخن إلى الأسفل و ان أقصى قيمة لمعدل انتقال الحرارة تكون للصفيحة المربعة المثقبة بنسبة تثقيب 0.6 و لزوايا الميل المختلفة. بزيادة رقم كراشوف إلى 5x10^4 يقل معدل انتقال الحرارة ما عدا الصفيحة المربعة الأفقية وجهها المسخن إلى الأسفل حيث يكون أقصى قيمة عند نسبة تثقيب 0.6 . تزداد قيم متوسط رقم نسلت بزيادة زاوية ميل الصفيحة المربعة وجهها المسخن إلى الأعلى لتصل إلى أعلى قيمة لها عند الوضع العمودي وبعدها تقل بزيادة ميلان الصفيحة، و إن أقصى قيمة لمتوسط رقم نسلت تعتمد على نسبة التثقيب، و إن أقصى انحدار لدرجة الحرارة يكون عند الحافة الخارجية للصفيحة المربعة و المثقبة الأفقية المسخنة إلى الأعلى و عند الحافة السفلى الخارجية في حالة الميلان . تم مقارنة نتائج الدراسة الحالية مع نتائج عددية و عملية لدراسات سابقة و كان التوافق بينها جيد .